RBTH presents a selection of views from leading Russian media on international events, featuring a report on calls for the introduction of martial law in the war-torn Donbass region of eastern Ukraine and the “instructors” alleged to have been sent from NATO countries, as well as analysis of the strategies of Moscow and Kiev in the light of the deadly shelling of Mariupol on Jan. 24. 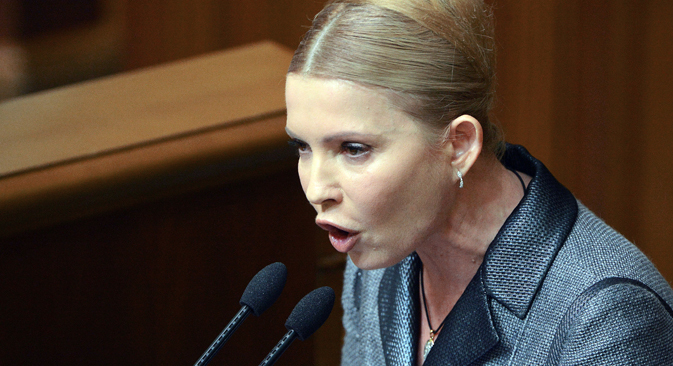 Deputies in Ukraine’s parliament, the Verkhovna Rada, including Yulia Tymoshenko of the Batkyvshchina party and Radical Party leader Oleh Lyashko, are calling for Ukrainian President Petro Poroshenko to introduce martial law in the country and the designation of Russia as an “aggressor-state,” reports tabloid newspaper Moskovsky Komsomolets. Meanwhile, the Ukrainian Defense Ministry has announced that the Ukrainian army is building up its reserves in all conflict zones. For their part, the rebels have declared that they will “move back the line of the front” in order to avoid shelling of residential areas in Ukrainian cities by the Ukrainian army. The paper reminds its readers that on Jan. 26, Kiev imposed a state of emergency in the Donetsk and Lugansk regions of eastern Ukraine. According to Prime Minister Arseniy Yatsenyuk, this step will allow better coordination of all authorities. Yet a number of Ukrainian experts support the initiative to introduce full martial law, arguing that it will allow for better control of areas liberated from rebel control. Meanwhile, according to reports by the RIA Novosti news agency, citing Eduard Basurin, deputy commander of the self-proclaimed Donetsk People’s Republic, “instructors” from NATO countries are arriving to support the Ukrainian forces. "The security forces are carrying out shelling of squares, because many instructors have arrived from the NATO countries, and their tactic is to shell residential areas, so that their forces, which will later enter these quarters, will suffer fewer losses,” said Basurin. Citing Russian President Vladimir Putin’s recent statement that the Ukrainian army is “a foreign NATO legion, which, of course is not pursuing the goals of Ukraine’s national interests,” Rossiyskaya Gazetaaddresses the issue of whether the alleged participation in the Ukrainian conflict of foreign troops “under the flag of the Ukrainian army” serves the interests of the Ukrainian people. The paper also speculates on the likelihood of the EU and U.S. responding to calls from Kiev for further support in the wake of the shelling of the government-held city of Mariupol on Jan. 24. The newspaper writes that Kiev “is not abandoning its attempts to turn the bloody provocation in Mariupol to its advantage, and is openly calling on the U.S. and the EU to participate in pressurizing Russia.” The call for broader participation by the U.S. and EU was made in a statement by Ukrainian Foreign Minister Pavel Klimkin. “One would like to think,” writes Rossiyskaya Gazeta, that after the “discovery of American weaponry in the airport at Donetsk,” and the alleged identification of “English-speaking soldiers” in Mariupol, further “military” participation by the U.S. “will be limited to the issuing of memorial badges to wounded Ukrainian servicemen.” According to the newspaper, the first batch of these medals was handed out in Kiev hospitals “with great pomp” by the commander of U.S. forces in Europe, General Ben Hodges. In an editorial titled “A Mandate for Conflict with the West,” the centrist newspaper Nezavisimaya Gazetaresponds to the accusations being traded between Kiev and the Donbass rebels over the shelling of Mariupol and writes that there is a very real likelihood that a new round of sanctions will go into effect as a result of the incident. It uses the latest rhetorical confrontation as the departure point for an analysis of what it sees as Russia’s apparent lack of interest in proving the justness of its cause to Western audiences, despite the economic costs. Russia is “not undertaking any efforts to convince Western politicians and society,” writes the newspaper. Russia is able to do this, according to the publication, because – according to polls – the majority of Russians get their news about Ukraine from Russian channels. “Answering questions, citizens de facto reproduce the rhetoric of the authorities. One way or another, public opinion together with a trust rating of more than 80 percent give Vladimir Putin a mandate for conflict with the West.” It is relatively unimportant how convincing the Russian point of view sounds abroad, says the newspaper: The main thing is how it sounds inside the country.